I'll be sending 2, but one at a time. Need one with me - even if I'm needing to futz with it to get it working. I have five of them. I'll be doing a lot of shooting in June and won't be ready to send them in until July. I reckon you can send your V6 during the first / second week of June which should match up nicely with the ETA of the new hot shoe. Please also include your return address on the envelop so we know where to send it back to. In the meantime if you need any assistance you can post a reply here or email us: info@cactus-image.com. Any update? Another wedding gone by with me fooling around w/ this v6 way too much to get it to work for the little time it does before I have to fool around with it again. Another one coming up this week. Really anxious to get this new mount. This is not fun. By the time we get yours, we will have the new hot shoe all ready for replacments. Thank you for the long wait. Thank you for the good word, Antonio! So, is it just me, or is it more $ to send this back than to just buy a new one when the new ones are available?? Antonio, can the mount just be sent to us and we put on?? JuniorJr, it is quite expensive, though I was able to bubble pack two v6's into a small USPS priority mail box and ship for about $25. Additionally, I purchased a new v6 direct from Cactus and Antonio had them send it out asap. I just received it today and have tested it out on my D750 and it is working. Still just a tad fiddly to get seated but it is working and once seated I was able to knock the flash, v6 and camera about a bit while not losing connectivity once established (power flash, v6 and then camera in typical top down fashion). However, Antonio, the pin to seat the v6 seems to have a spring in it and allows it push back up a bit? It also seems quite short and requires quite a throw of the lever to seat and lock properly (hence I could see breaking the tab at some point). If you can install a longer pin that is more stable/no spring, it might alleviate a bit of the issue. @JBoot ming you, there is a locking pin and when you secure the hot shoe lever, the pin is enaged. So despite it might be fiddly (and if talk about fiddly, try mounting a Nikon SB-800 speedlight on your D750, it may feel even more insecure! ), it is by no means going to hop out of the hot shoe mount to surprise you, because the locking pin is tagging the V6 in place. So on that note, please do not lock the lever too tightly, otherwise you will break the locking pin mechanism (the spring inside). Speaking of spring, the hot shoe pins themselves are tested to be sufficiently long in keeping V6 pins well in touch with camera contacts, even with the springs pushing up the transceiver. So no worries there! Anything on this? I have the v6 and a D750 as well. Where to send back? I am from Singapore. I'm so glad I've found this thread. I've already been to 20 weddings this year and it's been an absolute pain. I would love to send my six v6 units in for hotshoe replacement. How do I go about doing this? Glad to know you found this place! If you could just send the V6 back without the original packaging, instead, bubble wrap each of them and send them off in a bubble jiffy bag, that would be sufficient protection plus savings on shipping. Thanks much. Now to figure out when I have a long enough gap in my schedule to send them! I guess you would need all 6 of them on a shoot, otherwise you could send them in 2 separate shipments so you could fix 3 first and then 3 at a later time. But sending all at the same time would be more economical. Just a thought in case your schedule is really tight. But sending all at the same time would be more economical. Just a thought in case your schedule is really tight. I'm planning to send you five (5) V6 units for the shoe swap, probably next weekend. Just wanted to confirm that you have the parts in stock. Thanks! Thanks for checking with us. We still have plenty left in stock so please send them back for service. In case you didn't see my recent reply here, I want to update you all on the situation with the "new" (or rather special) male hot shoe specifically made for D750 (and helped some X-T1) users on the Cactus V6 . hot shoe is different from any other NIkion cameras." time being, new customers may only purchase V6 with the special hot shoe directly on our Cactus Store. And for existing V6 users, you may still return them for swapping the special shoe by sending to our office address. Before placing an order or returning please confirm with us the number of unit(s) you are buying / sending us so we can check our stock levels. If you have any questions please let me know. Thank you. thanks for the update! I actually never sent my Cactus for retrofitting as I think I do not have such a big issue with the D750 and I also use it with my Olympus which has better synch speed. I was actually thinking of ordering one just for the D750 with the special shoe but can't find it in your store. How does it work? Finally, I am not sure exactly what the problem is as I really don't suffer much from it but I wonder if you could make a small adaptor? If you rarely mount a Nikon speedlight on the V6 (TX) for on-camera fill flash (with TTL pass through) you won't notice any problem from the D750's hot shoe. And if you do use on-camera flash, adding an adapter with the V6 would add weight and clumsiness to your setup. One alternative is to use the Cactus RF60, which can act as a flash trigger controlling other TTL speedlights (mounted on V6) and as an on-camera flash at the same time. My 5 V6s arrived today with the replacement shoes and unfortunately I'm having some issues. I've updated the firmware to the latest version 1.1.019. There is a small but definite variance among the 5 units in how much each locking pin protrudes when it is fully retracted. Two of the V6s only slide about halfway onto the D750 because their fully retracted locking pins extend slightly above the flat surface of the V6 shoe. It's a very small amount but the protrusion seems to be catching on the D750's hot shoe plate. I can't see for certain due to the tight clearances. The one with the countersunk locking pin will cause my SB-900 to zoom as I turn my zoom lens. The Test button will wake the SB-900 and causes the flash's Ready light to start blinking but doesn't fire it. The SB-800 used to zoom with the old V6 shoe but does not with the new shoe, and its auto focus assist light flickers when mounted to this V6 on the D750. I did a factory reset on the V6 but the problems persist. The other two V6s do not zoom the SB-900 or the SB-800, and the flashes don't respond to the V6 Test button. I was successful in using one of the V6s to remotely trigger another V6 with the Quantaray flash mounted. I won't be able to exhaustively test all the triggers for at least a week, but it seems that the triggers' electronics are working and that the new shoes are introducing intermittent connections with the D750. I do appreciate your and Ray's help in performing the swap, but right now I don't have a single pair of functioning V6s. I will test further next week, but I wanted to let you know before too much time had elapsed. Thanks for any suggestions you have have. I second the variation observation. It is really annoying, some V6 will simply never lock as the pin stays inside the shoe or does not protrude enough. I have marked them so, so that I never use them on the camera. I am sorry to hear about the intermittent firing and the locking pin issue you reported. This is the first time we heard about this. I wil check with our QC and R&D teams and get back to you. In the meantime, I wonder if you noticed any differences between the firmware versions? @CDLigth: Also, don't forget to select the appropriate flash profile for the on-camera V6. Even for TTL pass-through, the selected profile should be correct. @Antonio: I went straight to the latest firmware as it's the only one that includes the longer delay while the V6 is learning a profile. Over the next weekend I'll check the performance of a few of the firmware versions that immediately preceded this and let you know. Thanks, too, for checking on the locking pin problem. This might be a QC issue as all 5 units mounted and worked on my D750 with the original shoe. As @dpservis has seen it, it's not necessarily an isolated event. Thanks for the tip, @Class A. I had initially forgotten to set the profile for the flash mounted as TTL pass-through but caught this during troubleshooting. I retrograded the firmware to the previous version and was going to test it on my D750, but wasn't able to mount it. None of the three V6s that previously mounted, with some force, would even slide into the hot shoe tonight. My son was able to mount one of the units on his D3300 with some difficulty. After mounting it a couple of times, he also was unable to mount it again despite wiggling the unit and applying force. As a result, I examined the pins on the new V6 shoes and compared them to two of my existing flashes. My first observation is that the springs behind the V6 pins are much stiffer than on my SB-900 and my old Quantaray DSZ PZ-1 flashes. They also protrude further out from their channels. On closer inspection, I saw that the pins are of varying shapes. Specifically, the single pin at the front of the V6 (opposite the locking lever) is bevelled very steeply and symmetrically on both sides, while the two pins nearest at the back of the V6 are bevelled more gently on the side facing backwards. When you push the V6 onto the camera hot shoe backwards, the gentle bevel presses against the hot shoe first and allows the leading pins to more easily be pushed down. I found that I am able to mount and dismount the V6s repeatedly on either camera when they are oriented backwards, but not forward. Even the two units that previously would not mount at all can mount backwards. It stands to reason that the combination of the steeper bevelled pins at the front of the V6, in combination with the stiff springs under these pins, are preventing the units from mounting. This leads me to believe that the pins were somehow installed in an incorrect orientation when the shoes were replaced. Unfortunately I don't have one of the original V6 shoes to inspect, so I've attached an annotated photo to illustrate. Let me know your thoughts. Thanks. I had a quick look at the pins of my V6 and they look exactly the same as in your photo. I'm not saying that installing them differently wouldn't facilitate mounting but it seems they were installed on your unit as designed. It seems like it would be beneficial if the front pins (nearest to the locking pin) would protrude about 1mm less in order to present more of their sloped profile. 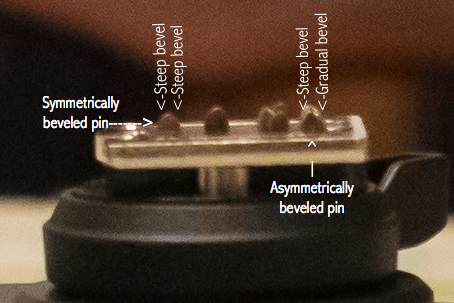 It looks like they are almost presenting a vertical face to the edge of the hot-shoe which would prevent a natural push-up of the pins to occur. Are you turning the locking lever fully to the left before mounting? Otherwise, the locking pin can get in the way. You may also want to try to angle the V6 slightly upwards when connecting to the hot-shoe and straightening it, as you push it in, in order to help with the pushing in of the pins, if that's possible at all with your hot-shoe.